I've recently been working on updating my hobby space. It all started in mid-June when I decided to order up a new desk and move my hobby area from the middle of my living room, to a corner of the living room. My old desk was cobbled together with something similar to a countertop and some old legs from a folding table. It was slightly too low though and I had to raise it up with some 2x4 wood planks, because I kept getting back aches. 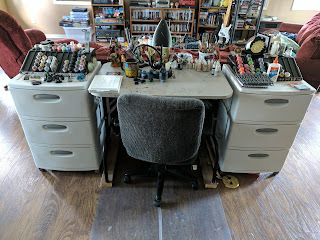 For storage, I used a pair of white plastic three drawer units and stored minis, paints and other supplies. On the left side, I kept bits and minis and the right was for scenics and basing supplies/tool. It worked well for a few years and was a huge improvement over the old set up I had, which was basically me sitting at the kitchen table. But, the drawers ended up being a catch all and completely flooded with junk. Also since it was close to my front door, I would drop things on the left set of drawers constantly. It was a mess, and time to consolidation and revamp. For my birthday, I decided to upgrade and buy a new desk. After some searching and finding a bunch of expensive options, I stumbled upon a nice L shaped, black glass topped desk by Whalen on Amazon. Instantly I knew it was the one I wanted, I loved the look of it and the price was spot on. So, after putting in the order. I started working on the living room and rearranging things. The first order of business was cleaning the area I wanted to set the desk up, so I was ready when it arrived. 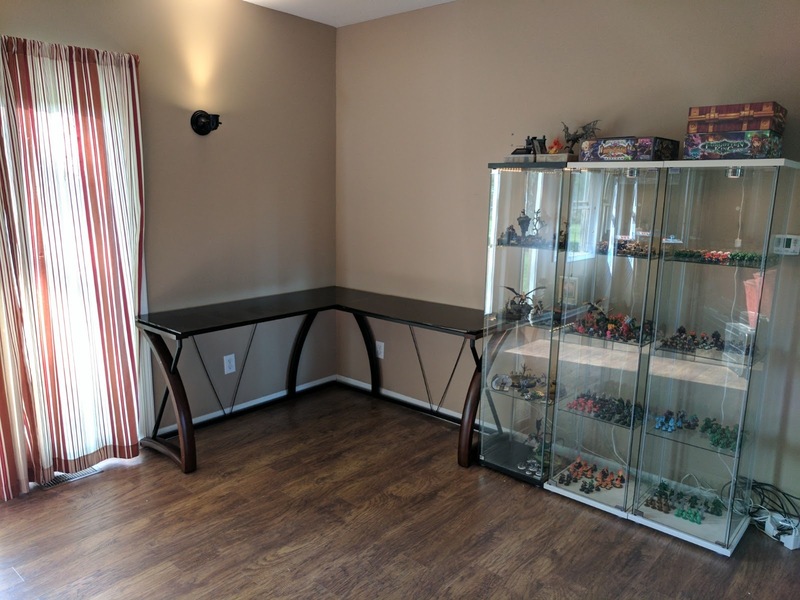 One of the main things I wanted to do, was move my glass cabinets over to the same area, and have a nice dedicated space with the desk, all of my display pieces and Super Dungeon Explore models in one place. This meant completely revamping the entrie corner of the living room. 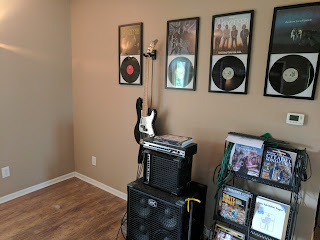 Originally, this corner was home of my custom built arcade machine, bass amp and speaker cabinet and an old magazine rack with music books and random other things on it. It was a mess. 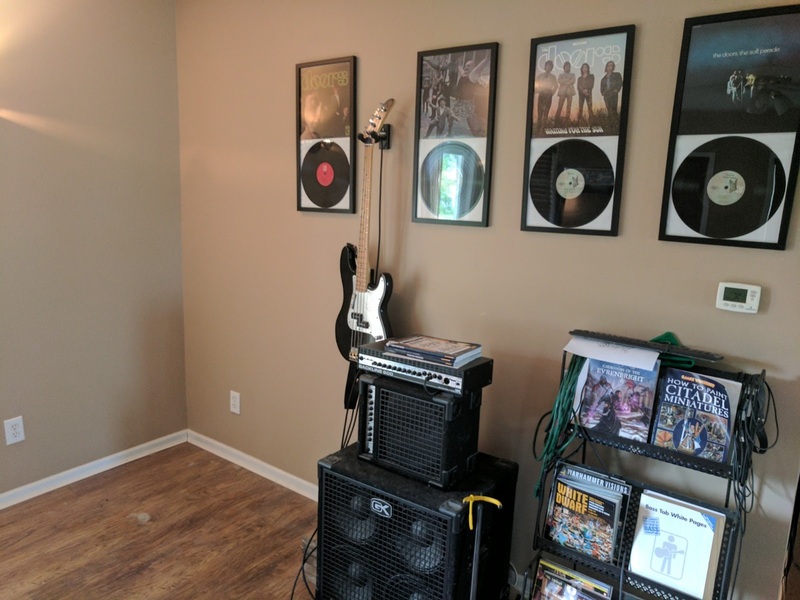 Also, along that wall I had hung original vinyl records of every Doors studio album. But with the Detolf glass cases going there, they would need to come down. A few days later, my desk arrived and I got to work assembling it and after, about an hour, I had it all put together and ready to go. The rest of the night was spent moving the old desk to the new and arranging things like paint racks, the lamp, cups and such. But one major problem arose when I realized I needed to change my drawer system. My old drawers were a set of 3 white plastic drawer units I'd bought at Walmart nearly a decade ago, when I moved into my first apartment and needed storage for my clothes. Since then, they've served different purposes, until becoming dedicated hobby drawers. Turned out those units would be much too big for the new area. They wouldn't fit under the desk and if I put them alongside the desk, they'd be in the way of the patio door. A new solution was needed. I needed something that would fit under the desk, but everything I looked at didn't really jive with me. A friend of mine suggested the Alex drawers from IKEA, and I was going to go that route. Even though I didn't like the price. Then, while talking to Sophie, she mentioned that she was looking at the Helmer drawers from IKEA and planning to pick some up for her desk. At $40 less than the Alex unit, I was instantly sold and made the trip to IKEA to pick up a pair. They fit perfectly, and look great under the desk. Plus the fronts have areas for labels, so I can sort tools, scenics and other bits into them and easily find things later. After one day of working at the desk, I realized the glare of my lamp off of the glass was a bit annoying. So I grabbed an old World of Warcraft TCG playmat and set that down at my work area. It turned out to be a great idea, as its basically a giant mouse pad, and it cushioned my arm while working. But, I also had an issue with that mat being too busy and colorful. I found taking pictures over it to be troublesome. That's when I had the idea to look into making a custom mat. printed things and one of which were neoprene gaming playmats. I instantly downloaded the template for Adobe Illustrator and got to work. The only problem? 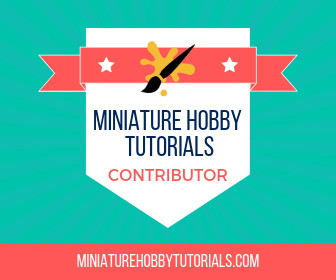 Since I only made it for use on the blog and smaller items, my logo was too low of resolution for printing. It would need to be rebuilt. Better, faster, stronger. So I did just that. The text wasn't an issue, since it was a standard font I still had access to. But the paint brush was a different story. The original logo had a clip art brush that I added some red paint to. But, since I was rebuilding it, I decided to recreate the brush in Illustrator myself. It was a fun little diversion and I sharpened some of my graphics skills back up too, which is always nice. 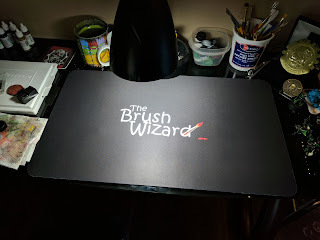 The mat arrived fairly quickly too, maybe 2 weeks from order to delivery. The quality was top notch and it definitely feels like a legit mat you could buy at a game shop. I've said it before, but I can't wait til this thing is ruined with paint splatter and battle damage. That's it for now, it's so nice having a fresh work space, that looks nice and seems more professional. It's been a long road, traveling from the days of painting at an old TV tray at my couch to this, and it's most definitely worth it. 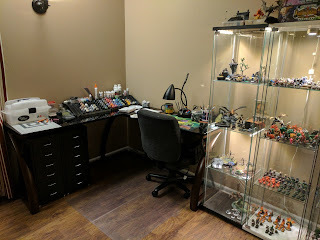 I have more upgrades planned, such as a row of shelves on the wall and a new paint rack. But more on that later.